How do you move from resentment to acceptance and graciousness? Have you ever been in a situation where you know exactly what stage you need to be in next, but just can’t seem to get there by will alone? I find that I really resent the extra time it takes to deal with my chronic challenges: because I don’t sleep well, I often need to be resting 11-13 hours a day just to get 8 hours of sleep, which is barely enough for my needs. Add to that the 20 minutes here, the half day there, and the “only 10 minutes” everywhere, I end up living in the struggle between what I have to be doing and what I want to be doing. I have been overwhelmed with the backlog of daily chores, emails, and “stuff” that have accumulated while I was away at Dr. Estes’ training, and while I was in Calgary for an extended family get-together. Also, in hope and excitement, I signed up for a 10-week online course that includes more painting and writing. (You know how it is: it was a REALLY good idea at the time!) Then “there’s always the unexpected” nature of life, the unexpecteds which usually need more time and attention rather than eliminating a chore or commitment. In this category are the two summer online courses that Liberty has taken in the past 3 weeks (two more days to go. . . ) which promised to occupy him and free me up, but have turned out to completely stress him out yet draw me in as chief organizer, calmer downer, and cheerleader. There are always stories about individuals who do the “impossible,” who overcome huge obstacles to achieve a goal. I respect those people, but the stories also contain the undertones of what they had to give up, or what sacrifices their families made to help them accomplish what they did. Those heroic stories are ones of single-mindedness and focus. I don’t have a life where I can or want to be single-minded — I have many goals, not one overarching all others. 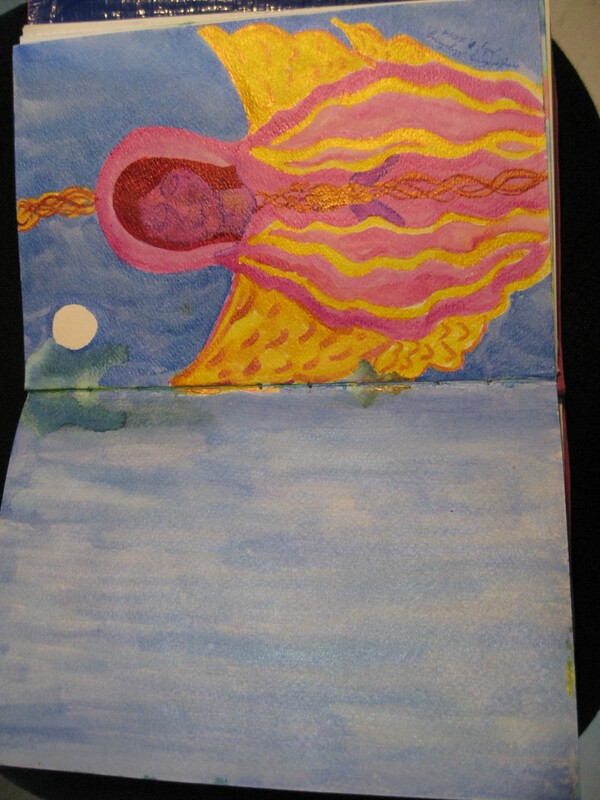 The painting and art journaling are really helping. There’s been a transformation happening in my last three major paintings that I’ll talk about when I post my next painting and poem. While “the pen is mightier than the sword” is pithier than what I want to say, I’ll still tell you that the paintbrush is more human than sheer willpower. An online friend of mine recently asked me how I do my journals, so I thought I’d post here a modified version of my reply to her. I must have mentioned here on the blog that I’ve kept journals for more than 40 years now; I’ve used all sorts of ready bound books, plain school paper in binders, small journals, big journals, everything you can imagine! I could probably give you the pros and cons on just about anything you can find on the market these days! There are only two things I regret in all these years of journalling: the years when I wrote very little, and the fact that it’s a real pain to move more than 10 bankers’ boxes full of journals every time we move. What I’m finding works best for me these days is to buy watercolor paper when it’s a 2 for 1 sale, Canson brand, 11 x 15 inches. 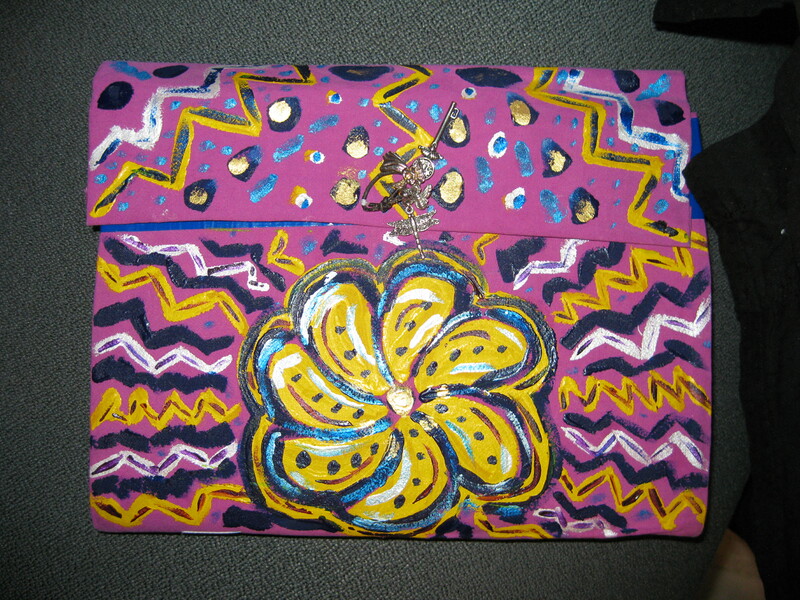 I fold those pages in half, take groups of 3 pages and sew them into canvas or heavy cloth covers. I usually use 5 or 6 signatures (the 3 page piles) per journal. I learned to make these particular books from the online art journaller Effy Wild, but there are many tutorials on youtube. I go for “useful,” and don’t spend that much time on “perfectly beautiful.” Now you don’t have to go to that trouble at all: a Strathmore Mixed Media journal, or a Canson XL journal have paper thick enough to paint on (and not buckle b/c of the wetness). I find dating my entries to be a real key for their usefulness to me in the future. I reread my journals from time to time, and note either my growth or my dealing with the same old/same old (my lifelong challenges, it seems!) What I do is put the date vertically along the borders of the page, and that seems to look nice. It’s also consistent, which means I can find a particular date easily, even in a journal where I might have 2 pages for a day, or 10. When I use acrylics in my journal, as I do when I’m doing more “arting” rather than writing, or when I’m doing a collage or mixed media page, I find it tricky to write over the paint. It can be done, for sure, but you have to have the right pen, and it’s “lumpy”, i.e., difficult to write comfortably. 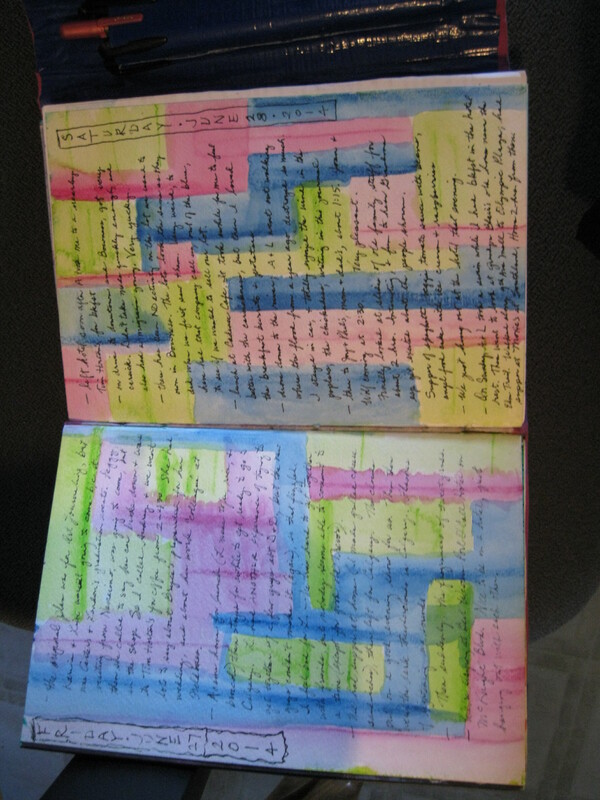 So I use watercolor paints most of the time in my journals because they are so easy to write on. I go through the book and paint pages before I need them. Then they’re ready for when I write. Mostly I use 2 or at most 3 colors on the 2 page spread, and keep it either plain, or use larger squares and other shapes that would give me nice spaces to write in. 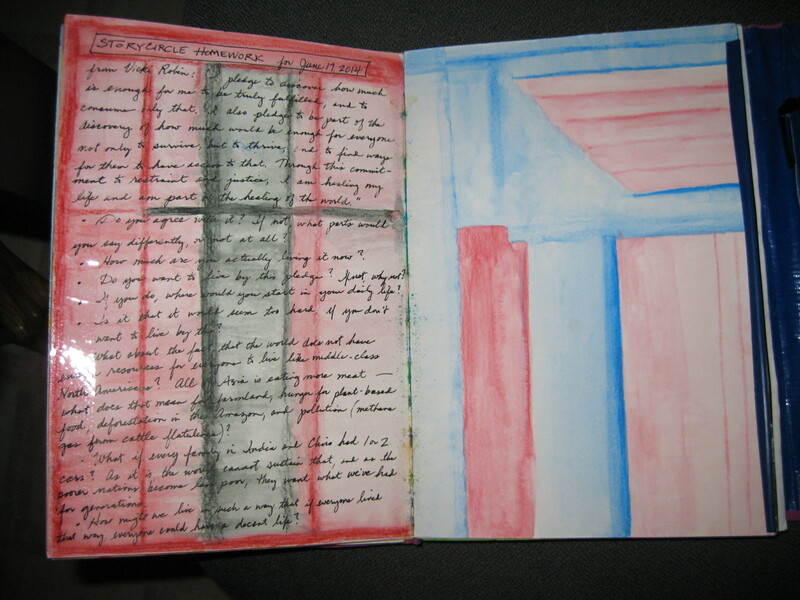 Some of the pages I include here have been made with watercolor pencils, just horizontal and vertical stripes. 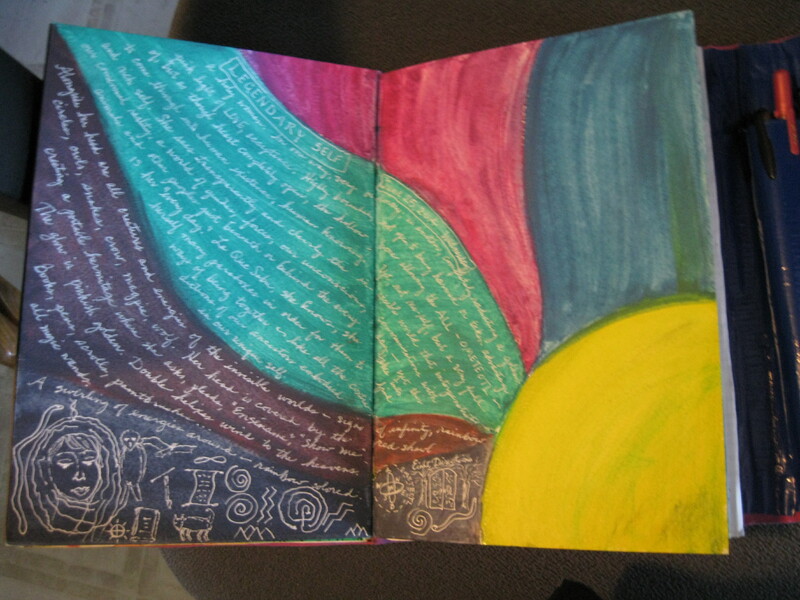 When I then go over them with water and a brush, I bring the colors together to cover the whole page. This prepping of the pages can be done while I’m on the phone or listening to an audio, or sometimes even having coffee with friends. VERY IMPORTANT: I don’t try to be perfect, or make it look particularly “beautiful”. I find that way of thinking to be paralyzing. I just aim to get some color on the page. I let it dry, turn the page, and slap down more color. I can always add more color, or add collage, or anything else that will spice it up, and I often do. I love doing this —- the colored page invites me to write. I journal almost every day, and often add a sentence or two at several times during the day. My journals are not expensive, so I don’t worry about “ruining” a page. I just go for it, and some pages ARE better than others (as you can see from the ones I’ve included here). If you work with your dreams, I’ve developed a system that works well for me, after years of more awkward solutions. Because my journal’s pages are 7 1/2 in. by 11 in., I take cheap notebook paper (that’s usually 8 1/2 by 11), and cut an inch off the width so that the papers can eventually be tucked into the back cover of my journals. I take those notebook papers, and have them on a clipboard onto which I’ve taped a pen, so that I can write my dreams in the dark. If you want to record your dreams, it’s important to have the paper and pen ready, because large muscle movement often causes the dream to disappear. I have 3 of those: one by my pillow, one by the lazyboy chair that I sometimes sleep in, and one in a magazine holder in the bathroom. That way, there’s always appropriately sized paper, and pen or pencil, everywhere I might find myself when I’m awakened. In the morning I collect whatever dreams I’ve recorded, date them, and read through them, adding details or making my writing clearer, and then I name the dream. I try to pick descriptive names that tell what’s happening in the dream so that the title will help me easily picture the dream. On a page in my journal, I list the dream titles chronologically. This helps me quickly find the date of a dream I might want to work with more deeply. Then I collect the dreams themselves, in order, and clip them into the back of my journal. 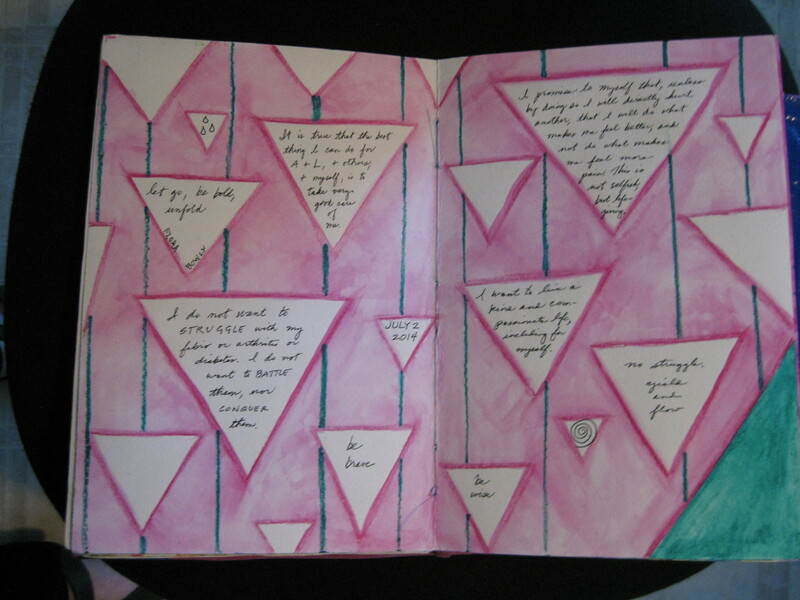 My journals are like scrapbooks, too, in that I glue in notes from others or daily life ephemera. For several years I did more traditional photo-scrapbooking. I like that, too, but that’s in a different category for me. The photo-scrapbooks were made for other people’s eyes, whereas my journals are made for me. I put in whatever pleases me, whether it’s “beautiful” or “perfect” or not. And if I don’t like how a page turns out, I don’t tear it out or destroy it; I just turn the page and start again. That’s also how I try to do life: move forward, turn the page and start again! It’s been almost a month since I’ve written, and I’ve missed connecting with you. In early June, I left “on pilgrimage” to the fourth year of the five year “Mysterium” training put on by Dr. Clarissa Pinkola Estes. Though the training is only a week long, it is intensive with 7 to 8 hours of instruction given by Dr. E. Though there is a small amount of student commenting and working in dyads, it is primarily presentation by Dr. E. I admire her preparation and stamina, and feel very gifted in being able to attend this series of trainings in which she is presenting, over five years, what she learned in her Jungian psychoanalytic training. There is no certification or degree involved in this training, but there is this wonderful knowledge base that I immerse myself in even more deeply throughout the following year. As many of you know, it’s quite the ordeal for me to attend the training. I start out on a Sunday, driving with a friend the three and a bit hours to the airport in Great Falls, Montana. We stay overnight, then I fly out on the Monday for Denver. Another overnighter there, then I drive about two hours to the training venue, Sunrise Ranch, in Loveland, Colorado, for the Tuesday afternoon start. Coming back I take only one extra night in Denver, and fly back to Great Falls, then drive back to Lethbridge on the following Monday. This year, I developed either food poisoning or a very nasty virus the first night in Denver. It completely knocked me down. Travel is hard enough, but with this. . . . It took several days to recover from the ordeal and its concomitant lack of sleep. But it was still SO GOOD to be there! There were about 120 participants, mostly women, but including several men. I connected deeply with a few of the women who have been to the trainings for several years. Dr. E was in great form. The training topics were deeply fascinating: advanced dream interpretation, and “Descansos”: a timeline of our lives (and in this case, also our parents’ lives) where we noted the places where we encountered a symbolic death in our lives, whether of trauma or options closed to us, etc., and then looked at the totality of our lives in connection with how our parents (to the best of our often limited knowledge) experienced their own “deaths” and stopping points. The third major topic we studied was using the Enneagram as another way to look at the Wheel of Life and our gifts in facing the realities of the life in front of us. While Dr. E teaches with the intent that we will be using this material when we work with the people who come to us for help, she wants us to work deeply with each of the ideas and techniques first. So while it’s certainly not a therapy week for the participants, the teachings bring us deep within ourselves and are a wonderful opportunity for soulful growth. I think the greatest blessing for me in the trainings has been the consolidation and deepening of the work that I’ve done in my years as an educator and counsellor. I have learned so much in so many venues throughout the years, including in that “School of Hard Knocks” and the university called “Life”. In working with Dr. E, I’m pulling it all together in deep, solid, and extremely useful ways. I often wonder what next to do with all of this, how best to pass on the gifts I’ve been given. 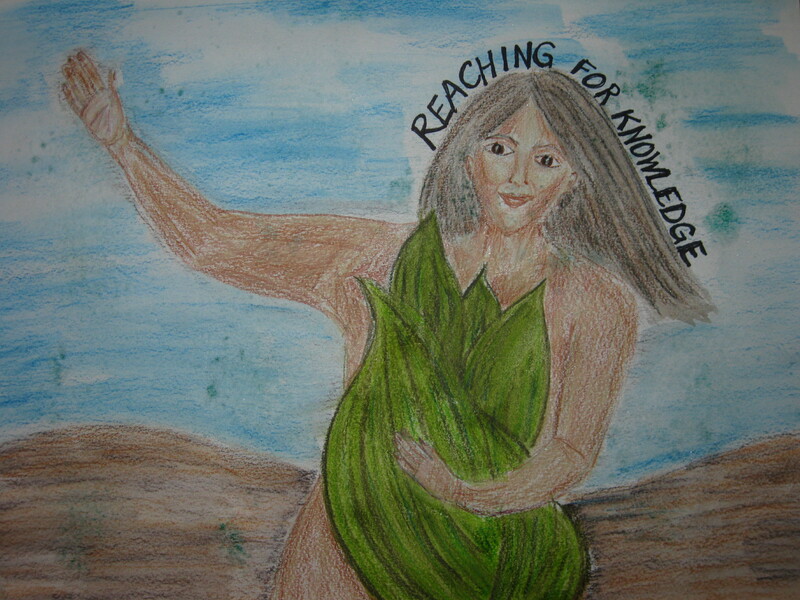 Oh, I’ve got ideas, many more ideas than time or energy to actualize, so I have to discern how best to help “within my reach”, as Dr. E advises. One thing I feel convicted of is that I will continue to write, and write more deeply, as I organize my daily life to make this possible.